Designed by Winnipeg school architect J. 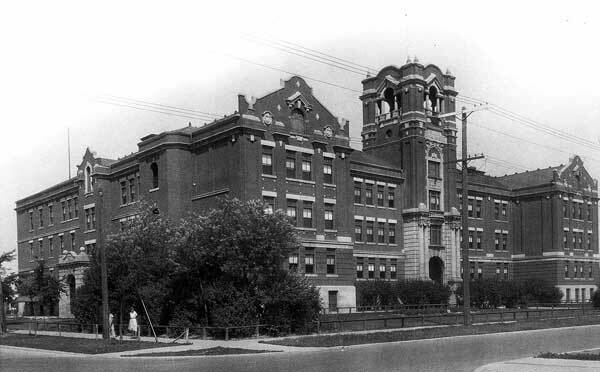 B. Mitchell and built between 1910 and 1912, St. John’s Technical High School opened for classes in 1912. Its twin, Kelvin Technical High School, opened around the same time for students from the southern part of the city. With exteriors of Tyndall stone and red brick, the interior floor plans for the two schools were identical. The basement housed rooms for “technical” instruction in machining, woodworking, electrical work, mechanical drawing, and plumbing; dressing rooms for the gymnasium; the boiler room; four toilets; and two offices for teachers. On the ground floor was the auditorium, gymnasium, eight classrooms, household science room, and four toilets. On the second floor was a balcony overlooking the auditorium, a running track over the gymnasium, five classrooms, library, commercial classroom, typewriting classroom, and rest rooms and toilets for teachers. Finally, the third floor had eight classrooms, chemical and physical laboratories, museum, and two toilets. Altogether, there were 38 rooms where instruction was done. At the time of their construction, the schools were thought to be the most thoroughly modern schools in Canada. The original St. John’s building served the community into the 1960s. By that time, its layout was seen as obsolete and its structure and mechanical systems needed repairs. 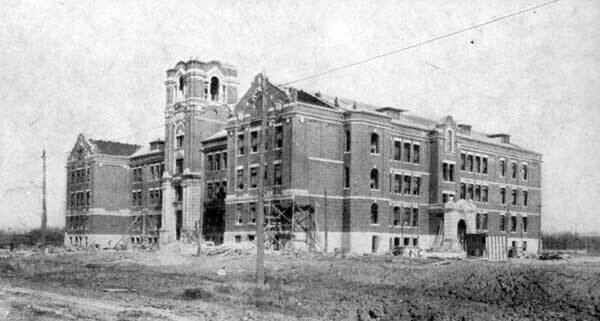 Rather than make a large capital investment for renovations, a new St. John’s school was constructed nearby and the old building was demolished in 1967. Noteworthy alumni of St. John’s High School include Burton Cummings, Monty Hall, Sybil Shack, Louis Slotin, Arnold Spohr, David Steinberg, Adele Wiseman, Abe Yanofsky, and Joe Zuken. Among the other teachers of St. John’s High School were Henry Andrew Moroz, Margaret Gow, John Lawrence Thistlethwaite, and Victoria Morris “Vicki” Cielen. Source: Winnipeg School Board, Annual Report 1921, Legislative Library of Manitoba. “Winnipeg’s new technical high schools – Kelvin and St. John’s,” Manitoba Free Press, 22 April 1911, page 52. “Miss M. Horner gets school music post [Elsa Handel],” Winnipeg Tribune, 26 November 1946, page 11. Obituary [Rose Eileen McCord (1897-1961)], Winnipeg Free Press, 10 October 1961, page 30. “Winnipeg School Board tells who is teaching where,” Winnipeg Free Press, 31 August 1963, page 18. “Teachers, Principals of Winnipeg Schools listed,” Winnipeg Free Press, 29 August 1964, page 12. Obituary [Hank Promislow], Winnipeg Free Press, 11 July 1998, page C7. “New principals named,” Winnipeg Free Press Community Review, 11 July 2001, page 28.